Parents say ‘having the police in school may result in more young people being labelled troublemakers, and leaving school with a record’ – what kind of start in life does this give them? AS parents and carers of children at Hampstead School, we oppose plans to replace the school police officer who left in July 2007. Instead we want student welfare assistants who came in when the police left, to continue. We also want the school to engage with the children’s concerns and the pressures on them. At a recent school meeting, a show of hands showed that the majority of parents present did not want the police in school. There was general agreement that violence in school was not a problem, but violence outside was. A number of parents spoke about their children being attacked and robbed on their way to and from school. Having an officer in school does nothing to deal with this. Children have told us how when the officer was there, he had refused to help with anything outside. On one occasion the students themselves had to gather the evidence against a persistent thief who waited for them outside. Eighty per cent of children at Hampstead School are black or from an ethnic minority. Black parents and staff at the meeting complained about racist targeting by the police. Home Office figures show that black people are six times more likely to be stopped and searched than white people. Incorporating police into the staff takes the emphasis of the school away from education and towards monitoring and criminalisation. The Safer School Partnership Protocol, the agreement between the school and the police, which we knew nothing about, says that the police have been brought in to deal with day-to-day problems such as inappropriate and bad behaviour, bullying and truancy, and can also attend staff, governor and parents meetings. A recent debate in the House of Lords expressed concern about the growing trend to criminalise children. Nearly 600 school-age children are convicted or cautioned every day; some end up in prison. We feel that having the police in school may result in more young people being labelled “troublemakers”, and leaving school with a police record. What kind of start in life does this give them? 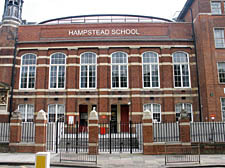 Our worries came to a head in November 2006 when the riot police (TSG) turned on Hampstead’s children as they left school. Widespread indignation from children and staff witnesses, led to the head pursuing an official complaint against the heavy-handed police response and the racial targeting of students. The police rejected it and the school is appealing. There has been no apology from the police for the violence they displayed on that day – that is not a good role model for our children. The costs of having a police officer in every secondary school in Camden could pay for welfare staff and extra-curricular activities for young people, so desperately needed. Some schools have found ways of working with the police without having them on the staff, including improving response times when they are called in emergencies. Why can’t Hampstead call a community meeting to discuss the way the area is being policed and how children can be better protected on their way to and from school? The police should be dealing with crime not with disciplining children. They are not educators and our schools should be independent from them. By Sairah Brown, Kay Chapman, Kim Cummins, Gina Martin Edwards, Roy Martin, Alexander E Musset, Anne Neale, Virginie Papantoniou.